Overview: Black Magic is a 3-reel, 8-line slot with a spooky witch doctor vibe. 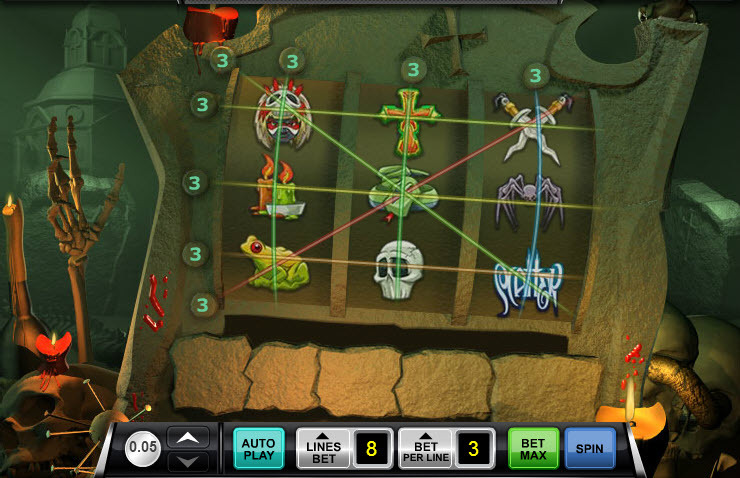 Rise above your fear of the snakes, spiders and skulls found in the witch doctor"s lair to discover the creepy winning combinations and earn big bucks. Use that newfound black magic to get three nail-pierced voodoo dolls in a single pay line and get paid the maximum 6,000 credits. Bet the max of 3 coins per line for a total of 24 credits per spin. Coin denominations range from 0.05 up to 5.0. There are plenty of images to be wary of in this game, but don"t be afraid of the scatter symbol, which can be your ticket to big wins. Gather up three of those symbols anywhere on the screen and double your bet"s payout. The multiplier increases incrementally the more scatter symbols appear. And if the screen is all filled up with nine scatters, you"ll be rewarded with 2,000x your line bet. 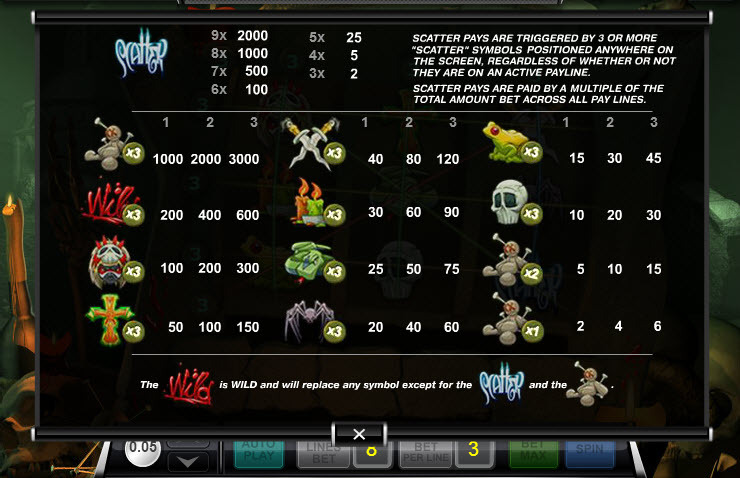 A payout with that multiplier could reach up to 48,000 credits, and there"s nothing spooky about that kind of jackpot. Online Play: This slot machine is featured at online casinos that run Ace Gaming software. You can try it risk-free by utilizing the free, no-deposit welcome bonuses that are offered at many Ace Gaming sites; if you decide to play for real, then be sure to play at a Ace Gaming casino that offers an initial deposit bonus of at least 100%. Similar Slots: If you like Black Magic, you might like these other slot machines from Ace Gaming: Crazy Coconuts, Party Bucks, Roughneck Reels, Wild Sushi.